RP: Because nothing says "bulletproof" like "plastic"
4 Responses to RP: Because nothing says "bulletproof" like "plastic"
A… B… C… D… EEEEEEEEEEE! You know, that’s something I’ve always wondered. When the villian sees shooting the hero in the chest is a waste of time why do they never adjust and aim for the head? It’s always like “Ooo, that shot didn’t work. Let’s try another one in the exact same spot.” Sure the head is harder to hit than the chest, but it seems like they always just aim for the chest, never the head. I think that too guys, especially in “Iron Skull” stories before his ironhood somehow took over the entire body. But I have to give this particular writer props, he actually has the villain say in the next panel that since the body is protected he’ll go for the head. Of course he’s punched into oblivion before he can do so. The other random thing I’ll note is that these guys have no problem killing the bad guys. 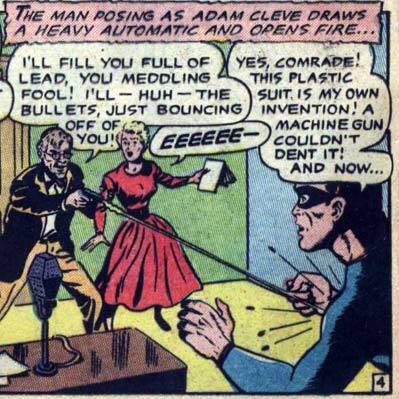 I assume this is a byproduct of WWII, but half the time the villains end up shot, drowned, stabbed, or otherwise dispatched and the heroes seem quite happy about it.